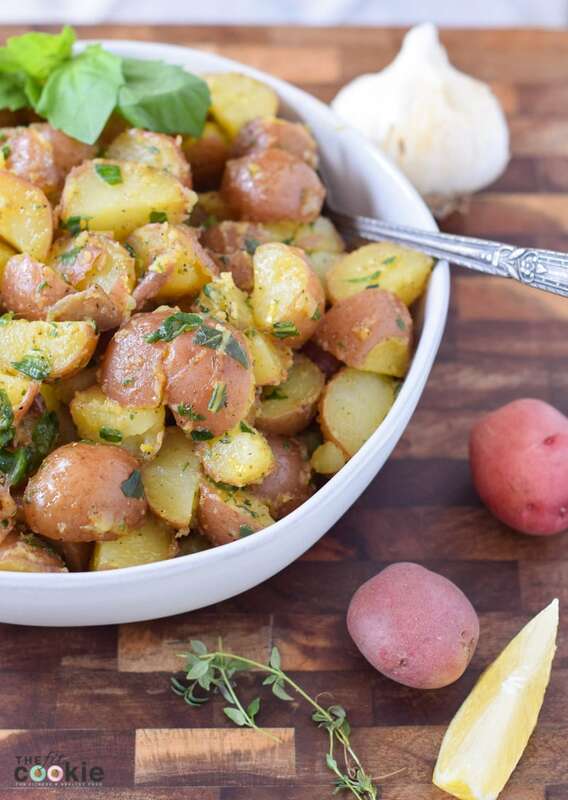 Make a healthier potato salad that’s great any time of year! 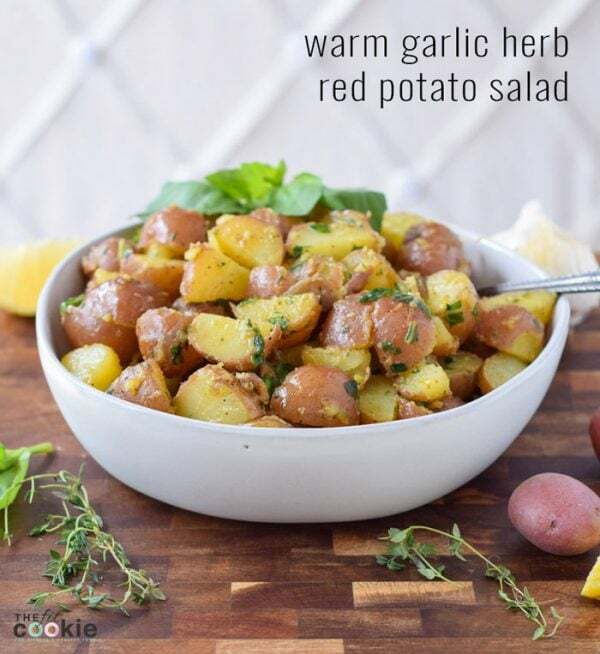 This Warm Garlic Herb Red Potato Salad is perfect as an allergy friendly side dish for any occasion, and looks impressive as a dinner party side dish. 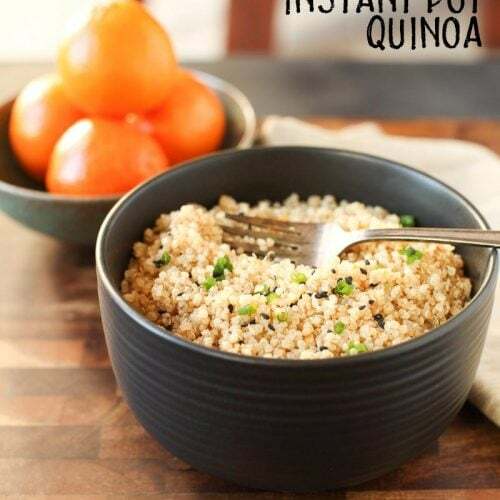 This recipe has no mayo and is also grain free, gluten free, dairy free, egg free, and vegan. 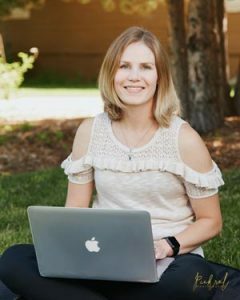 Since the New Year has started, it seems like everyone has goals of some kind: fitness goals, nutrition goals, business goals, etc. I’m not into resolutions, but I love it when people make goals throughout the year! 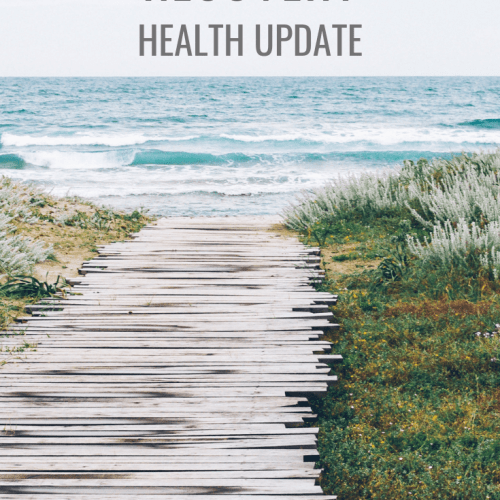 Even though I haven’t really written a post about my goals for my this month and the coming year, I do have a short list of them. One of my goals for my blog is to be a bit more diverse in my recipe offerings, posting more savory dishes, mains, and sides. Another goal of mine is to continue to eat healthier, and potatoes are a great way to eat healthier. 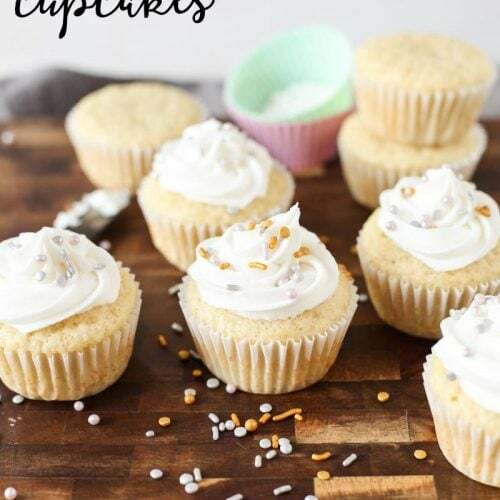 They are convenient, provide a base for tons of recipes, and they are a staple in every culture around the world. 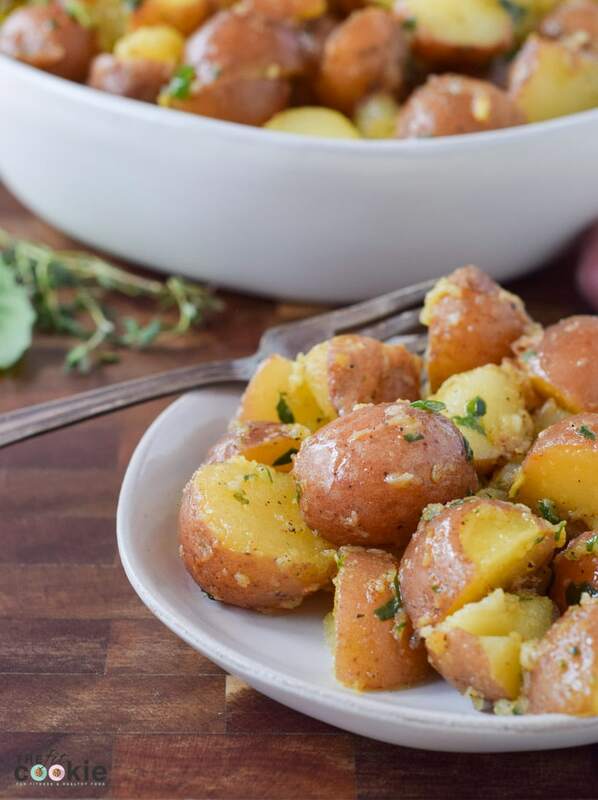 Potatoes provide tons of healthy recipe options! I keep small potatoes on hand to bake in the microwave when I need some healthy carbohydrates quickly. 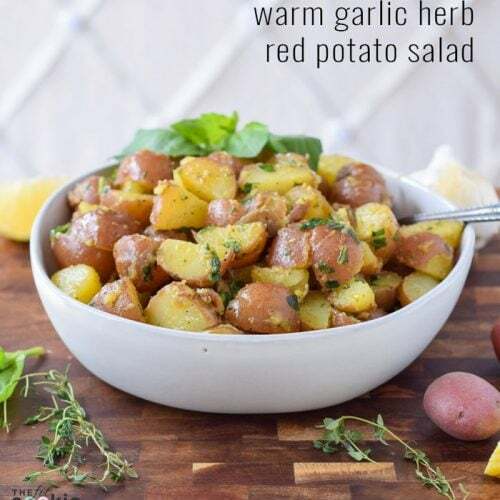 This Warm Garlic Herb Red Potato Salad meets both of my goals in one recipe: it’s a savory side dish and it’s a healthy makeover of traditional high calorie potato salads, and it’s sooo good! 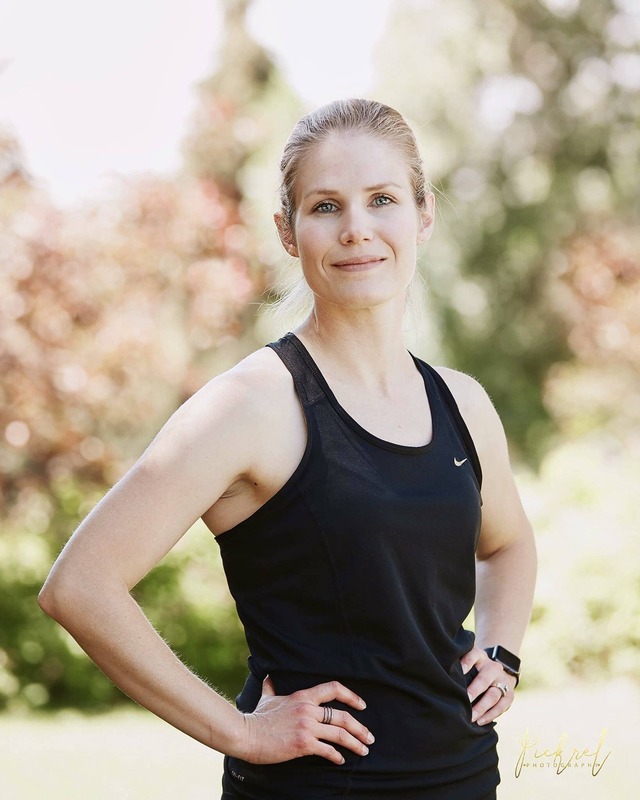 While not all of the recipes on The Fit Cookie can be considered healthy, I do try to make the majority of our recipes better-for-you. This red potato salad is healthier than traditional potato salad recipes since it has less fat and calories, no refined ingredients, and it’s allergy friendly. 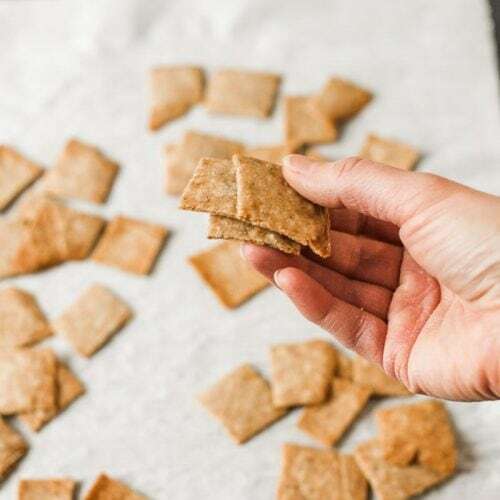 If you want to lower the calories even more in this recipe, you can reduce the olive oil to 3 Tablespoons instead of 1/4 cup (which is 4 Tablespoons). We also left the skin on the potatoes, adding a bit more fiber to this recipe. Leaving the peel on red potatoes in recipes adds some nice color to your dish, plus peeling these potatoes is impractical since they are so small. That would be quite a chore! 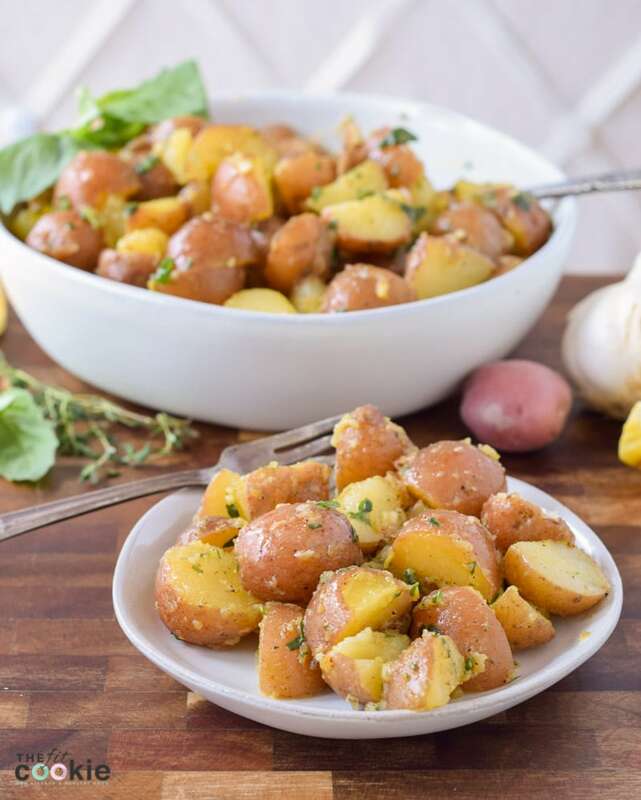 The amazing thing about this warm potato salad is that it’s quicker to make since it doesn’t take several hours to chill, plus it’s great to have as a side dish all year long, even in the fall and winter, since it’s warm. 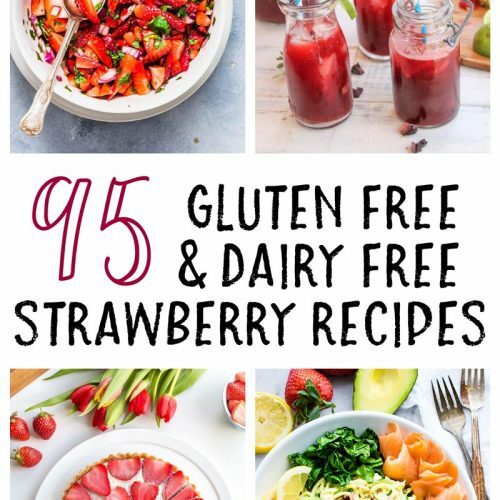 If you want this recipe chilled in the summer, you can certainly refrigerate this for several hours, it still tastes great! 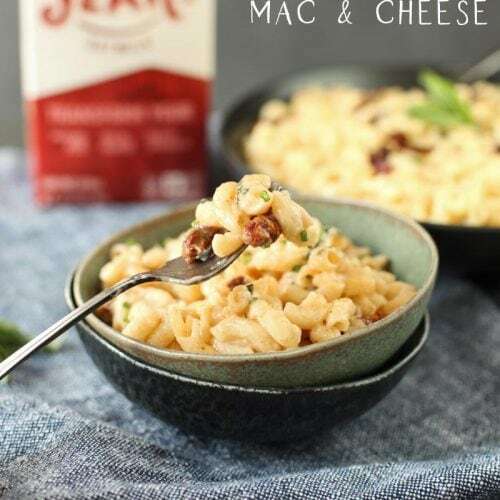 I used fresh garlic in this recipe and it can be a bit strong, so if you’re not in to strong garlic, you can use roasted garlic instead of fresh garlic. Or you can use garlic powder instead as well. For more great potato recipes, like the Potato Goodness Facebook page and follow them on Pinterest and Instagram! 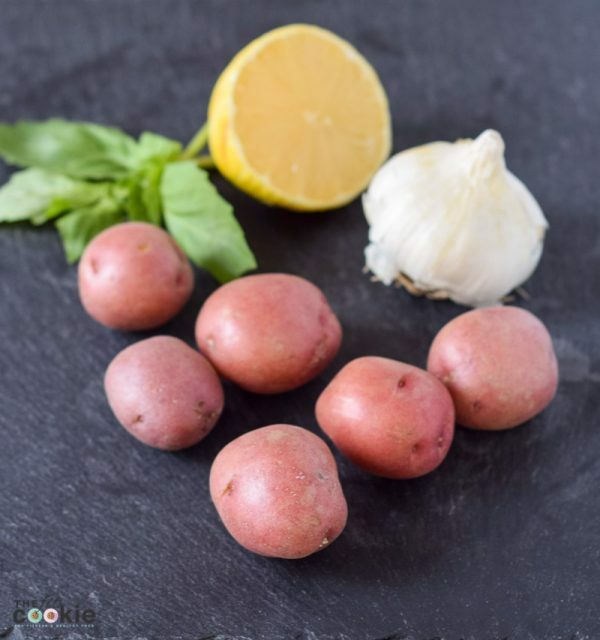 Add the washed and unpeeled red potatoes to a 2 quart or 4 quart heavy sauce pan, add enough water to cover the top of the potatoes. Bring the pot of water and potatoes to a boil, and boil for 15 minutes until the a fork can pierce the potatoes easily but are still firm enough to hold their shape. Remove from the heat and drain the water from the pan, and allow the potatoes to cool for about 30 minutes. You can spread the potatoes out on a baking sheet to allow to them to cool a bit faster if you need. While the potatoes are cooling, prepare the dressing. 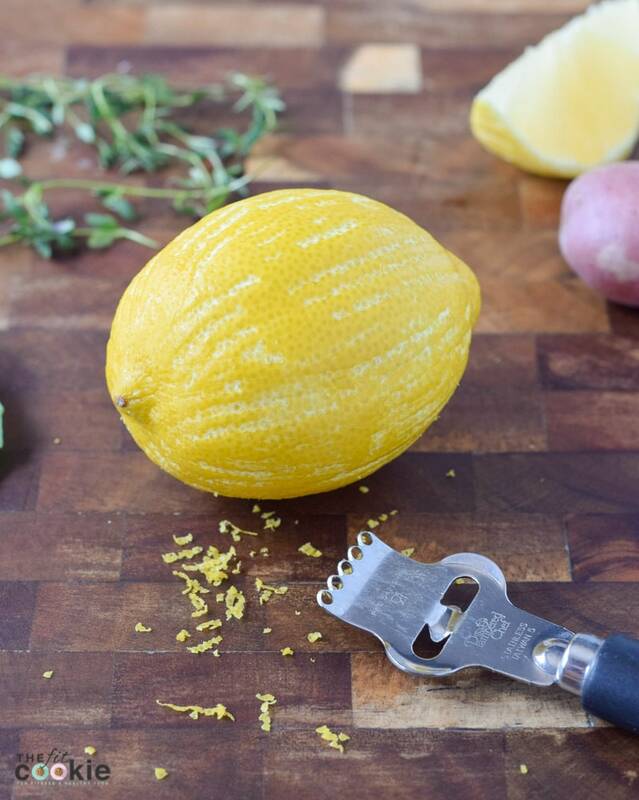 Place the olive oil, basil, thyme, garlic, lemon zest, lemon juice, salt, cajun seasoning, and black pepper in a small blender and blend just long enough to emulsify the dressing and mince the herbs. Once the potatoes have cooled a bit and you can handle them, cut each potato into bite-sized pieces. Since my potatoes were small, I just quartered my potatoes. Add the Garlic Herb dressing to the potatoes, add the sliced green onions (or chives), and stir until well mixed and the potatoes are completely coated. Serve while still warm. Store in a sealed container in the fridge for up to 3-4 days. Delicious easy light salad everyone will love!